Harriet engages the audience and can build a cohesive team. She leaves the audience better prepared to meet the diverse challenges of a modern day work place. Working, living, and interacting with the Japanese people is especially difficult in today’s world. I chose Harriet to help me because she has lived there and “walked the walk!” Harriet discussed the nuances, stressed the importance of eye movement and contact and the importance of bowing and its respect. 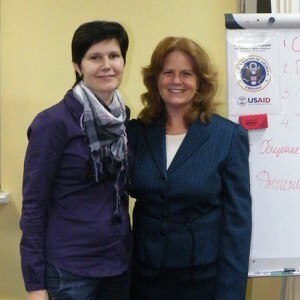 I had the pleasure of working with Harriet Russell as an interpreter on her trip to Minsk, Belarus in the fall of 2011. She is an extremely professional and effective presenter in a variety of contexts. Her presentations were all well-structured, up to the point with relevant information for the audience. Simply put, Harriet Russell is a charismatic person. More specifically she is friendly, energetic and involved. Harriet is knowledgeable in many areas as well as street-wise. She has international business knowledge, cross cultural expertise, in-depth information and years of experience in the global realm. When Harriet speaks, people listen. She draws from many fields, many cultures and many disciplines. She is conversant in several languages (Spanish, Japanese, Russian, and can even recite Hindi and write/read Sanskrit). And the topics range from business, international relations, personal development, spiritual awareness, health, understanding food, communication, ancient cultures and, more or less, you name it. Any discourse she presents will have depth and perspective. Harriet has shown tremendous knowledge of culture and language, particularly in Asia, and she has a great sense of business principles. She understands how business and culture work together. You will find that Harriet will be a tremendous addition to your team. The bottom line is: Harriet gets results. There is no one who is better well-versed in International communication. From customs to body language, Harriet prepares the business person working internationally to hit the ground running. 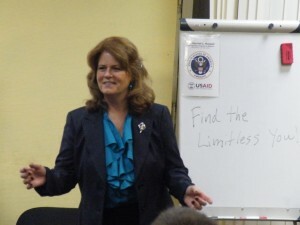 Rick Dudnick — VP, Lontos Sales & Motivation, Inc.
All of our international business saw an increase in profit and productivity once Harriet Russell showed us how to interact with our counterparts overseas.